The IBM 4039 LaserPrinter features the ability to add duplex capability, and broader connectivity than the 4029 series of IBM LaserPrinters. A PostScript Level 1 interpreter with 39 Type 1 outline fonts, PCL5, and true 600 x 600 dots per inch (DPI) meet user needs for broader functions as standard features on a compact desktop LaserPrinter. The 4039 LaserPrinter is designed, through integrated network adapter options, for attachment to Token-Ring and Ethernet local area networks, and networks with the Appletalk Network Interface. In addition, direct attachment, via parallel or serial, can be made to IBM Personal Computers, RISC System/6000 and Apple Workstations. The 4039 does not support PPDS. The Lexmark** 4039 10plus printer is a new versatile network/desktop laser printer by Lexmark for attachment to Personal Computers, and PC compatible products, RS/6000 systems, and attachment to Local Area Networks via its INA slot. The Lexmark 4039plus printer is marketed with the Lexmark logo as a Lexmark product. The Lexmark 4039 10plus has all the functions provided by the current IBM LaserPrinter 4039 plus series, with new advances. The 4039 IBM LaserPrinter Model 10R comes with 2 Mb of memory, expandable to 16Mb. The printer engine speed of the Model 10R is up to 10 pages per minute. A 250-sheet output bin is standard. The IBM 4039 LaserPrinter provides computer customers with industry leading 600 x 600 DPI printing with PostScript Level 1 interpreter with 39 Type 1 outline fonts. This will improve the customer's ability to efficiently produce in-house published documents, including newsletters, brochures, presentations, and business graphics in a shared environment. The IBM 4039 LaserPrinter provides the multiple connections, high-speed parallel (standard), high-speed serial (standard), and attachment to systems or LANs (optional Integrated Network Adapters) or via the IBM 4033 LAN Connection Option for Printers and Plotters. As a result, customers will realize a high level of flexibility with the IBM 4039 LaserPrinter including the ability to relocate the printer to a wide range of Workstations and Print Servers , such as IBM Personal Computers, IBM PS/2 computers and RISC System/6000 workstations, and computers compatible with IBM PCs, and networked systems. Print quality for image intensive documents is greatly enhanced through 600 x 600 DPI printing. The printer with integrated adapters allows you to have network location freedom. This Printers can be located in the user work area and is not required to be directly attached to the network print server. Print-job throughput may be increased because of faster communications between the IBM 4039 LaserPrinter and the Network. Customer set-up time has been decreased and the task has been simplified with the addition of the IBM 4039 LaserPrinter to the current 4029 Printer family. Standard features include PCL5 and PostScript Level 1 interpreter plus additional printer memory that provides 600 x 600 DPI as shipped from the factory. Increased throughput with the IBM 4039 LaserPrinter allows the customer to share this printer on a local area network with little or no impact to office Productivity. The expandable memory (up to 16MB) can increase productivity with improved performance achieved by facilitating scalable font cache, images, and forms stored in the printer memory. Automatic Emulation and Mode switching is standard in the IBM 4039 LaserPrinter Printer. This is especially important in a LAN or other shared environment. Installation Utility diskette with printer drivers is provided with the IBM 4039 LaserPrinter printer for ease of software installation for the Average or Advanced Network administrator. LAN file server security has been increased by removing the printer from direct attachment to the print server, allowing the server to be in a locked security area while the printer is in a more accessible setting. The IBM 4039 LaserPrinter printer is upgradeable with some of the options and features of the other printers in the IBM LaserPrinter family. The 4039 has expandable memory to 16MB, an optional duplex feature, various paper trays, all of which provide the ability to expand the 4039's function and useability. With IBM 4039 LaserPrinter supporting Novell** NetWare** 2.2 and 3.11 with Token-Ring (IEEE 802.5) and Ethernet (IEEE 802.3 or Ethernet II) protocols, customers can now direct attach printers and plotters to their current networks. Customer can add The 4039 printer to their existing Novell NetWare Server or networks as their printing needs increase. Additional LAN print servers may not be required with this increase in the customer's print requirements. With the removal of printer from the file server, server security has been increased. File servers can now be maintained in a locked (secure) area. The IBM 4039 LaserPrinter offers performance advantages over the traditional approach of sharing printers attached to file servers, dedicated personal computer print servers, or attached to an individual user's workstation. With PostScript Level 1 interpreter as a standard feature the IBM 4039 LaserPrinter printer will be supported by many PostScript Level 1 language applications. Thus, customers will be able to choose from over 600 PostScript Level 1 language application software packages which take advantage of the attributes of the PostScript Level 1 page description language. The 4039 offers Print Quality Enhancement Technology PQET for extremely sharp text and graphics and can print on a variety of paper types and sizes as well as on transparencies and labels. The IBM 4039 LaserPrinter has been tested for software compatibility by IBM for IBM logo software or by the non-IBM software publishers for non-IBM logo software. These tests form the basis for the compatibility results indicated. The testing was done using the currently available version of the software package at the time of testing, or the specific version indicated. Compatibility may not be the same for all versions. Representations relating to software compatibility with IBM printers are provided to IBM by various software publishers. The software publishers should be contacted directly for specific questions. Programs bearing the IBM trademark are subject to the warranty and disclaimer provisions of the IBM PROGRAM LICENSE AGREEMENT. With respect to non-IBM logo software, warranty, if any, is provided by the software publisher. IF DISTRIBUTED BY IBM, THESE PROGRAMS ARE DISTRIBUTED ON AN "AS IS" BASIS. IBM MAKES NO WARRANTIES EXPRESSED OR IMPLIED, INCLUDING, BUT NOT LIMITED TO, THE IMPLIED WARRANTIES OF MERCHANTABILITY AND FITNESS FOR A PARTICULAR PURPOSE. Address any questions pertaining to warranty coverage for non-IBM logo software to the relevant software publisher. With respect to non-IBM logo software distributed by the software vendor to a non-IBM supplier, disclaimer and warranties are as specified by those parties. Please contact the nearest IBM Authorized Dealer, your IBM Marketing Representative, or software publisher for additional information concerning compatibility. The compatibility information Presented below is intended to give general guidelines for the attachment of IBM printers to selected non - IBM computer systems. The IBM printer implements IBM's version of the parallel interface or RS-232 serial interface. IBM has performed limited tests of the IBM printers and the non - IBM computer systems using the appropriate cables and DOS print facilities. There were no problems noted attributable to interface differences. The only way to insure satisfactory results is for the user to test the specific printer, computer, and software combination against desired results. IBM MAKES NO WARRANTIES, EXPRESSED OR IMPLIED, INCLUDING BUT NOT LIMITED TO,THE WARRANTY OF MERCHANTABILITY AND THE IMPLIED WARRANTY OF FITNESS FOR A PARTICULAR PURPOSE WITH RESPECT TO THE COMPATIBILITY OF IBM PRINTERS AND NON-IBM COMPUTERS. This product utilizes the security and auditability features of host hardware, host software, and/or application software. The 4039 IBM LaserPrinter Model 10R comes standard from the factory with the following features installed: 2 MByte of printer memory, PostScript Level 1 interpreter with 39 Fonts PCL5 Printer Emulation for 100% Plug and Play with HPIIIsi, auto Emulation switching, and Integrated Network Slots for Network Connectivity. A 10 PPM laser printer with a 16.0 Mhz and 29200 microprocessor, 1 font cartridge slot, 2 emulation option connectors, auto-paper size sensing, 200-sheet Input standard, 600 DPI resolution PostScript Level 1 language capability, PQET hardware, 250 sheet output tray. Face-up or collated output is provided. The IBM 4039 LaserPrinter is a customer set up (CSU) printer. The CSU information is contained in the Getting Started manual which is supplied with the printer in the National language. All proposals and agreements to distribute the product/software package to the United States Government must identify and license Software as subject to Restricted Rights under 48 C.F.R. 52.227-19 (a)-(d) (Civilian Agencies) or 48 C.F.R. 252.227-7013 (c) (1) (ii) (Defense Agencies). Print quality enhancement technology (PQET), a user friendly 4x20 character LCD operator panel, multiple resolution print quality capabilities, 300 DPI and 600 DPI standard and versatile paper handling options are some of the basic functions of the IBM 4039 LaserPrinter. 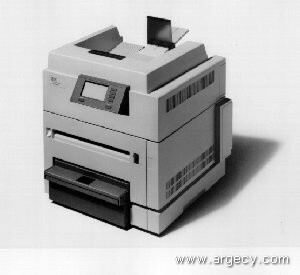 The IBM LaserPrinter 4039 Model 10R Series Printer is an additional product to the IBM 4029 LaserPrinter Series family. with the optional 500-Sheet Second Drawer. and 305 mm (12.0 inches on top for proper operation. The IBM 4039 LaserPrinter comes with an installed "clean-hands" Long Life cartridge which yields an average of 10,000 pages at 2.8% page coverage (7,000 pages at 5% page coverage). IBM Personal Printer Data Stream (PPDS) is not supported. Due to the IBM 4039 LaserPrinter's printing technology, the stationery supplies designed for use with the xerographic copiers should provide satisfactory print quality and feed reliability. Other types of supplies may be suitable for use with the IBM 4039 LaserPrinter. It is recommended that the users test any particular brand for suitability to their applications. Refer to the IBM 4039 LaserPrinter 10R User's Guide for complete details on stationery supply specifications. Preprinted forms and letterheads should be selected using guidelines found in the IBM 4039 LaserPrinter 10R User's Guide. The chemical process used in preprinting may render some papers unsuitable for use with the IBM 4039 LaserPrinter. Many transparencies specifically designed for xerographic copy machines may be used with the IBM 4039 LaserPrinter. Most labels specifically designed for xerographic copiers or laser printers may be used with the IBM 4039 LaserPrinter. Labels should be selected using guidelines found in "IBM LaserPrinter Label and Heavyweight Paper Guide" P/N 1058248. IBM 4039 LaserPrinter printable area is limited to within 4.2 mm (0.167 inches) of the top and bottom edge and to within 6.25 mm (0.25 inches) from the left or right edge of the media. Any information placed within this area will not print (except for A4). For A4 paper, the information is adjusted to fit 80 characters per line at 10 characters per inch. The interface selection is made via the IBM 4039 LaserPrinter 10R operator panel. IBM 4039 LaserPrinter supports the following LAN interfaces. The second drawer provides an alternate automatic paper feed source. It is installed at the base of the machine. It comes with a 500 sheet letter-size paper tray (#5837) or a 500 sheet legal size paper tray (5831). The Duplex Option provides the capability to print and collate double-sided pages through the PostScript Level 1, 2, and PCL5 data streams. The Duplex Option comes with a 14" special paper tray that allows duplexing from the standard paper tray location. Due to the design of this tray, input paper capacity is reduced to 130 sheets. This feature is portable and interchangable with other IBM 4039 LaserPrinter. Each card contains the more popular fonts for the applications indicated, i.e., Publications (#9153), 25 fonts, Presentations (#9154), 26 fonts, and Wordprocessing (#9155), 26 fonts. A Font Card Adapter, part number 1325231, feature code 5231, is required to support any of these Scaleable Font Card options. To be used with PCL4 and PCL5 emulation font cards for IBM LaserPrinters. Memory Options extend IBM 4039 LaserPrinter user memory. Since there are only two slots available for memory, only two memory cards can be installed at a time. The two available slots include the slot occupied by what has been described as standard for the IBM 4039 LaserPrinter. Printer memory can be expanded up to 16MByte. 5495, 5496, and 5497 built prior to 11/29/93. part number 6450242, feature code 0242, is required. Note: LocalTalk cables are not included with the Localtalk Integrated Network Adapter (INA). Downloadable Fonts: Fonts available on diskettes. Refer to the Special Features section for description, and F/C listing. The LaserDriver DOS utility which can be used to send printer definition commands from the PC. Resource Manager utility which controls download of fonts and forms to the printer (IBM OS/2 only).